Charities Seeking Art Supplies | K. A. S. Art Gossip! K.A.S. 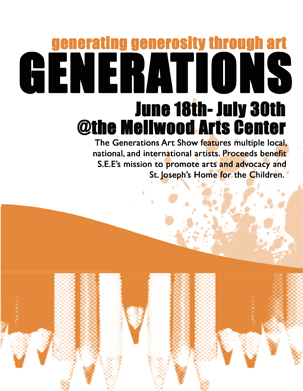 Art Gossip would like to thank to Action Graphics Inc of Louisville as well as participants in the Generating Generosity Through Art: The Generations Art Show that took place at Mellwood Art Center from July 18th to July 30th. Last week S.E.E. Joining Community & Arts donated supplies for art classes to the activity department at St. Joseph’s Children’s Home. More donations would be appreciated as you can never have too many art supplies! If you would like to donate art supplies contact Sally Walko SallyW@sjkids.org or go to www.sjkids.org for more information.